That Israel was complaining yet again on the way around Edom in Numbers 21:4-9 is not surprising. The people have done little other than complain against God and His providence during their journey through the wilderness. Even their complaint is nothing unusual (finding parallels with passages like Exodus 16:3 and 17:3). What is unique about this passage is the punishment the Lord sends against them in the form of “fiery serpents.” The word translated here as “fiery” is related to the word “seraphim” from Isaiah 6:2, which might be translated there literally as “the burning ones.” But it is not as clear in Numbers 21 what the word is meant to describe. Is it “fiery” because of their bite, a burning sensation? Is there something about their appearance which makes them seem like fire? They do not need to be a miraculous form of snake, since the Lord has shown through the plagues and other similar miracles that He may use even what is “natural” to fulfill His will. Moses even mentions them in passing in Deuteronomy 8:15 as if they were a normal part of the wilderness. But they may be related to the flying fiery serpents of Isaiah 14:29 and 30:6. Nevertheless, the question, while intriguing, does not change much in terms of the point of the passage. The people recognize their sin and ask for Moses to intercede for them. Aaron did a similar act earlier in Numbers 16:46-50, when he stood between the dead and the living to make atonement for them. Exodus 32:11-14 is helpful for understanding such intercession, because it recalls the longsuffering and the mercy of the Lord. He is the God of Abraham, Isaac, and Jacob, to whom He swore by Himself. The Lord commands Moses to fashion a metal image of a snake. Such a command does not break the law against such images in Exodus 20:4, because it is the Lord who commands it (compare the similar command to test God, normally forbidden, in Isaiah 7:11). Gazing upon this image carried with it the clear promise of deliverance. God delivered His people who had faith in Him and His promises, even in the midst of judgment. Jesus refers to this event while speaking to Nicodemus in John 3:14-15. As the serpent was raised up, so must the Son of Man be raised up. As gazing upon the serpent according to the promise delivered men from death, so will the Son of Man deliver those who believe in Him from everlasting death. The serpent on the pole delivered from a temporal judgment, and Christ on the cross delivers from an eternal judgment. 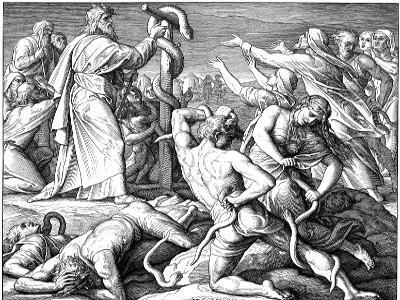 One must be careful, however, to not turn the serpent on the pole into merely a sermon illustration. Christ makes a comparison between Himself and the serpent of Moses, not an identification, so to speak. God delivered His people in a real and very historical way on the way to Edom, and this should not be overlooked. Christ delivers His people in a greater way, to be sure, and the serpent points to this deliverance. But if God did not act in history to work a very real, however limited, salvation, then why does the “story” have to be “real”? 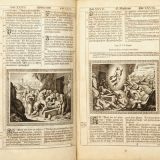 The parables are fictional stories which still make spiritual points. But the Old Testament is not a collection of narratives, so to speak, but an account of God delivering a “real people” through His “real acts” of deliverance in preparation for the great Deliverance in His Son. One final note about the bronze serpent occurs in 2 Kings 18:4. 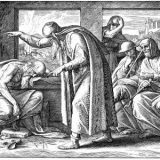 Hezekiah tears down that image and destroys it during his religious reforms, because the people had fallen into idolatry, calling it “Nehushtan.” They had corrupted the clear promise of God for deliverance and perverted it into something God had not intended. Israel had likely made it into a “god” in its own right, in spite of the clear commandment against it. But it also shows the very real danger to fall into spiritual security, imagining that God’s promises provide license for sin (compare Jeremiah 7:4). This is no less a temptation for Christians, who may exalt the love of God so as to extinguish His wrath.